First off, let me clear the air: We’re back in the randomness world. The more structured IronYou didn’t last more than three days — that is 72 hours. I know, epic fail. And if YOU like TheRandomYou more than TheStructuredYou, then who am I to deny it? It didn’t took that much to convince me though. I’m not the type of person that can easily fit into a cookie-cutter kind of life, let alone I can possibly blog in that kind of fashion. I still don’t know how I talked myself into that ; but as you see I got back to my senses and to the old me (tbh I don’t think there was ever a new me). In other words, TheIronRandom is back.Yo. 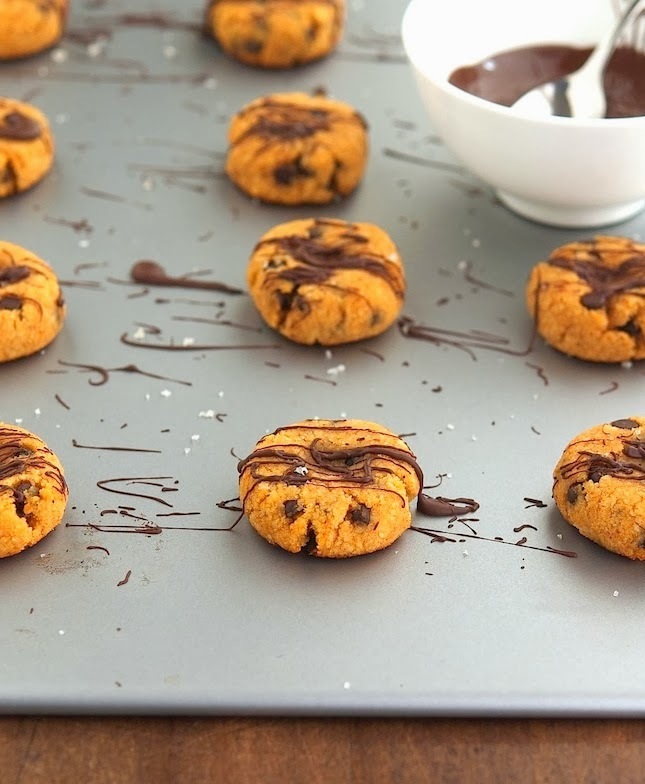 Moving on to these Almond Pumpkin Choc Chip Cookies. As it often happens in October, I purchase way too much pumpkins, and end up making huge amounts of pumpkin puree daily. Even though I’ve been whipping up this Creamy Pumpkin Garlic Rice quite a lot, I wanted to cook something else with pumpkin puree. That’s when I spotted a recipe for grain-free dark choc pumpkin cookies on Pinterest. It looked really good and thought it was worth giving a try. And next thing I know, I had pumpkin cookies baking in the oven. All in all, this is a pretty solid recipe. I like that there’s no butter, coconut oil, dairy or eggs in it. The pumpkin puree and the almond flour work as binders. It works, I guarantee. The cookies taste like pumpkin and chocolate with a mild almond aftertaste. All flavors I adore, but I know that they’re not right up everybody’s alley. So think about this before getting started. They’re also so easy to make. One bowl, one spoon, no melting, just a little mixing involved. I really like the add-on of chocolate drizzle on top, it gives a bit of crunchiness (its not only for aesthetic purposes). Trust. 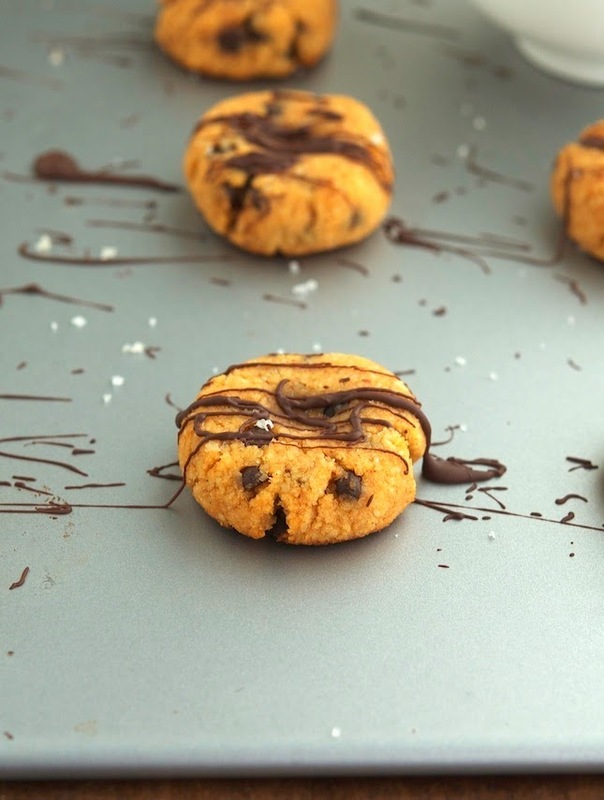 (Paleo) Almond Pumpkin Choc Chip Cookies Print this recipe! When baking with almond flour, you should be extra careful as it tends to burn easily. It’s important that you place the rack in the upper third level of the oven and that you bake the cookies for exactly 10 minutes (11 minutes for more crunchiness). If you leave them in the oven for a second more than that, they’ll burn. These cookies are soft and a bit chewy (which I love), just don’t expect anything too crunchy here. Preheat the oven to 350°F (180°C). Place a rack in the upper third level of the oven. Line a cookie sheet with parchment paper (unless you have a non stick cookie sheet like myself). Set aside. In a large bowl combine all your dry ingredients. In another bowl, whisk pumpkin puree and honey smooth. Combine dry ingredients with wet ingredients and gently mix with a wooden spoon until a dough forms. Finally fold in the chocolate chips. Scoop one level tablespoon at a time onto the prepared baking sheet. With your hands press balls of dough down gently and give them a look-alike cookie shape. Before you place the cookies into the oven, place another baking sheet in the lower third of the oven. This will help prevent the bottoms from burning. Bake the cookies in the oven for 10 minutes (11 minutes for more crunchiness). 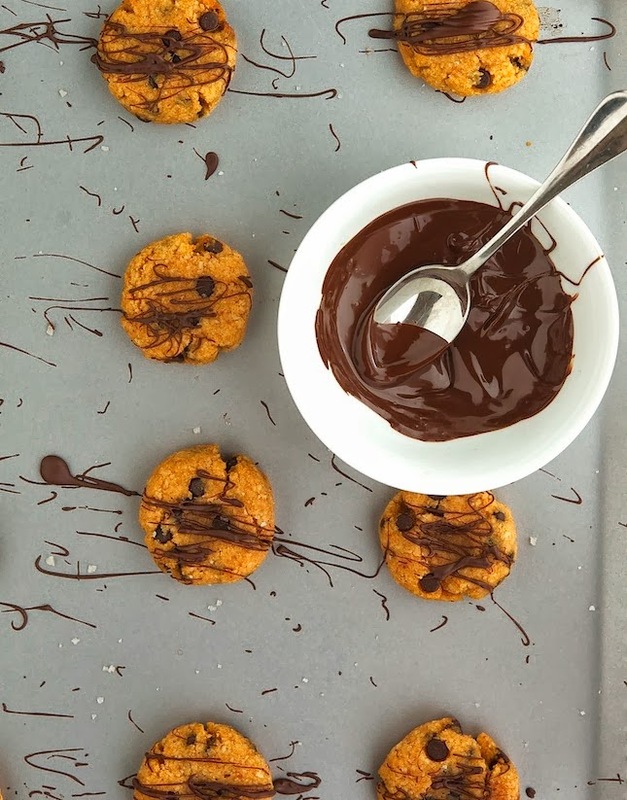 Melt the dark chocolate in in a double boiler over low heat (or in the microwave) and with a small spoon drizzle the melted chocolate over the cookies (you can also sprinkle a pinch of salt on top if you like it). 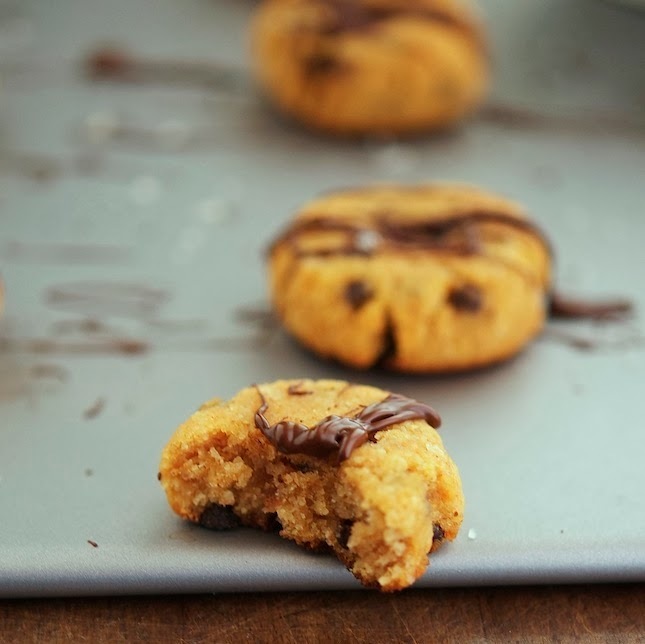 One cookie yields 114.8 calories, 8 grams of fat, 10 grams of carbs and 3.25 grams of protein. Yay for randmoness and double yay for these cookies, can I have some? OMG those cookies looks amazeballs! Um hello! They look so good! Geez, just how many pumpkins DO you buy? I sometimes will buy one and get so much puree out of it, I end up eating pumpkin through my ears. And you say you buy *too many*, as in several of them? You are one true pumpkin fan, my friend, lemme tell ya! Unless pumpkins happen to be on the real small side in your part of the world! yummy! what a great combination of ingredients! Can you subtitute the blanched almond flour with almond meal? These are calling out my name...they look just perfect, love the combination in the cookies, everything's good here. Greetings. Looks delicious. I think it will be delicious to take. Nice color.All ingredient are easy to collect. Nice blog. Oh, I'm so glad to see I'm not the only one whipping up cookies with no butter. These look delicious and I love cookies with almond meal!!! If I give these a try, I'll let you know, Mike. Happy Friday!!! These cookies look great - first when I read the heading I though you used almond butter - but then I saw you used almond flour! I have all the ingredients to make these. they look great! Has anyone tried this recipe with canned pumpkin? Which sweetener would you recommend has the best taste? Thank you for the delicious recipe Mike! These cookies are superb!